In 2018, Ulta Beauty released survey findings that revealed how people feel about the concept of beauty and what beauty standards are like today. 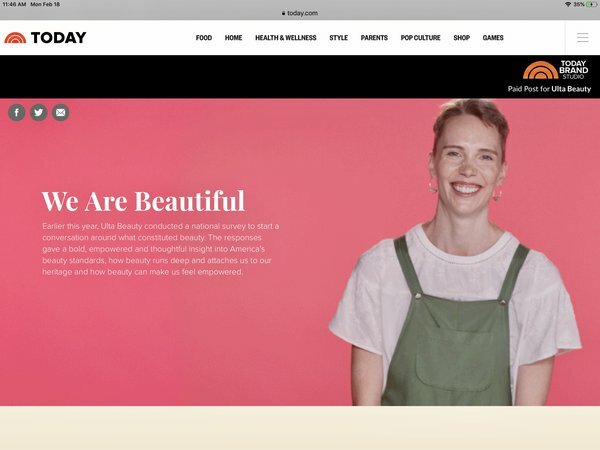 Ulta Beauty partnered with NBCUniversal to promote the survey’s findings and create meaningful content and conversation starters. Custom content helped redefine what beauty really means, proving that “the possibilities are beautiful” when you embrace and celebrate your personal beauty stories. To bring the survey to life, the TODAY Brand Studio filmed a series of poignant interviews where women discussed what beauty means to them. A mostly female team behind the camera helped drive the conversation forward. Each episode tapped into the powerful humanity at the core of true beauty and empowered women to redefine beauty for themselves—whether it be through embracing their heritage, defining their own standards of beauty, or learning to view beauty as an expression of their personal stories. Video performance surpassed benchmark with an average completion rate of 45%, compared to the branded content benchmark of 35%. Average scroll depth was 90%, compared to the industry benchmark of 56%. Social amplification resulted in nearly 6K post reactions and over 6K link clicks to the TODAY.com landing page. Partner with a major media company to share your survey results on a grand scale. Let your customers promote your product. This was a finalist in the Multicultural/LGBT Media category in MediaPost’s 2018 Creative Media Awards.